Warning: this review contains spoilers. Sorry. Couldn’t really discuss it without talking about the ending. 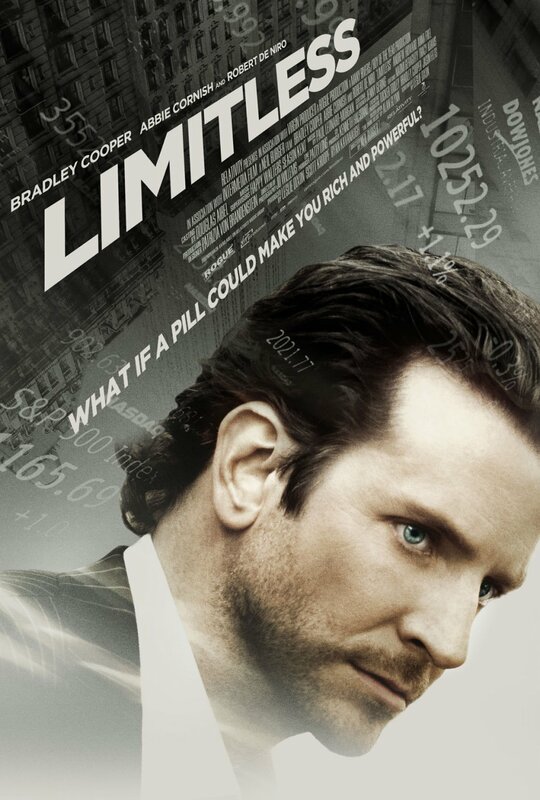 Bradley Cooper discovers that the drugs do work, and extremely well, in this watchable thriller that doesn’t seem quite sure which side it’s on. Cooper plays Eddie Morra, a failing writer freshly dumped by his exasperated girlfriend (Abbie Cornish, who is almost completely wasted in this). He happens to bump into his ex-wife’s brother who slips him a sample of MDT, a new pill that allows the user to access 100% of the mind’s ability. Unfortunately, it turns out that the pills aren’t quite as legal as Eddie had been led to believe, and he soon finds himself in possession of a large but finite stash on which he is becoming increasingly dependent, and which quite a lot of other people will kill to possess. This feels at first like a spin on the Faust story – someone given everything they ever wanted, with no apparent strings attached. Eddie wins back his girl, becomes a successful writer, and starts to make millions on the stock market. But of course there’s going to be a price to pay, sooner or later; we know that, even if the opening scene hadn’t made it explicit. Much of the film is good. There are twists; the identity of the person or persons following Edgar is kept well concealed – and director Neil Burger is particularly strong on the disorienting effect of the drug as Eddie starts to lose chunks of his memory. The difficulty is that Edgar is not a particularly sympathetic character. He starts out as a self-absorbed loser, becomes a drug-dependent overachieve, and at one point appears to have killed a woman (he can’t remember, and seems more concerned with the possibility of being arrested than with the idea that he might be guilty). Cooper’s movie star looks and a degree of charm allows him to carry us with him to an extent (Shia LaBeouf was apparently up for the role at one time, which would have been a different story) but even so, we want to see him brought down and learn his lesson. But here’s what’s curious: he doesn’t. He merely learns how to control his intake of the drug to prevent ill effects. By the end he claims not to be using, but it’s unclear (presumably deliberately) from Cooper’s performance if this is true or not. Which begs the question: what has he learned? How has he grown as a character? He’s standing for public office, but for which party? What are his campaign goals and promises? Is he simply out for his own glory, or is he planning to use his influence to make the world a better place? We’re not told. Consequently, Limitless becomes the tale of a man who achieves incredible success, fame and wealth by taking illegal drugs and getting away with it. Which somehow seems a little… odd. This entry was posted in Reviews and tagged Abbie Cornish, Bradley Cooper, Limitless, Neil Burger on March 16, 2011 by Gareth Negus.